We respect motorcyclists, because we count ourselves among them. 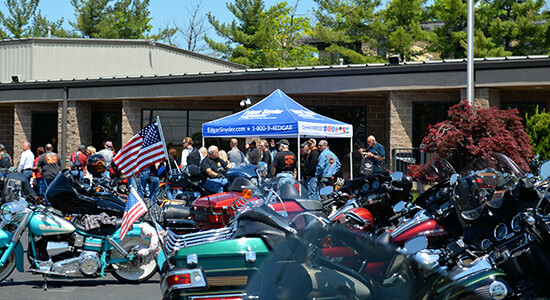 At our law firm, we enjoy getting involved through different motorcycle events and organizations. We've come to know many fellow riders and have been thrilled to help out some great causes. As always, if you or a loved one has been injured in a motorcycle accident, we're here to help. Call 1-866-943-3427 or simply fill out our free online legal consultation for a free case review. We sponsored WDVE-FM's ‘Hot Metal Harley-Davidson® Road Hogs with Rocky Marks,' a radio show that provides useful information to bikers. We've covered everything from motorcycle laws to accident prevention. Our law firm was proud to sponsor the 2014 Allegheny County Camp Cadet Motorcycle Run on May 31 at Hot Metal Harley-Davidson. Camp Cadet is a one-week event is a tuition-free experience for boys and girls ages 12-14 who are excited to understand more about law enforcement. Pennsylvania State Police, Allegheny County Police, Allegheny County Sheriffs, and local Municipal Police Officers act as counselors and instructors for the camp. While experiencing the living conditions of a real police academy, the campers learn all about Pennsylvania law enforcement, first hand, from experienced, professional officers. The cadets believe in building self-discipline, self-esteem, and confidence through teamwork and meeting new people. Learn more about the Camp Cadet Program here. We are proud to partner with the Officer James Kuzak Benefit Fund for the Annual 5220 Bike Rally at the Pleasant Hills Quaker Steak & Lube. All proceeds from the event go to the Officer James Kuzak Fund. Kuzak, a Clairton Police officer, was shot five times after responding to a home invasion call in 2011. All money collected at the rally supports his rehabilitation and recovery. Find out more about Officer Kuzak here. For years, we've been reaching out across Pennsylvania to partner with various organizations involved in their communities. We believe in helping people. Whether it's in the courtroom or through a motorcycle rally, we're there for you. If you have been injured in a motorcycle accident, we can help. Our legal professionals are standing by to assist with your claim. Call us at 1-866-943-3427 or simply fill out our online legal consultation for a free case review. We'll cover your upfront costs, send investigators to collect evidence, and protect your legal rights from pushy insurance companies. Since 1982, we've been standing up for our clients and fighting to get them the money they deserve. If you've been injured, don't hesitate. Calling us will cost you nothing, and, remember, there's never a fee unless we get money for you.